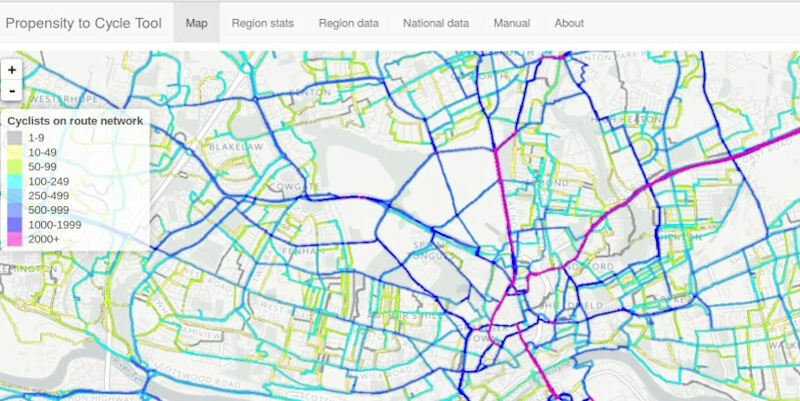 Interactive tools designed by University of Leeds researchers are helping transport planners decide where to make the most effective investments in cycling infrastructure. The Propensity to Cycle Tool (PCT) and Cycling Infrastructure Prioritisation Toolkit (CyIPT) are freely available to use and based entirely on open source software. Launched in 2017, the PCT had a rapid and significant impact. In its first year of operation, it was used by more than 20,000 people, including local and regional planning authorities throughout the UK. Both tools were commissioned by the Department for Transport (DfT) to support the Government’s target of doubling the number of regular cyclists in the UK by 2025. The Propensity to Cycle Tool shows the country’s great potential to get on their bikes, highlights the areas of highest possible growth and will be a useful innovation for local authorities to get the greatest bang for their buck from cycling investments and realise cycling potential. In its Cycling and Walking Investment Strategy (CWIS), the Government committed £1 billion to local organisations for cycling and walking programmes and road safety improvements to help achieve its 2025 target. Cost-effective investment needs to be based on reliable information on current cycling levels and the potential for growth in cycling, but historically this has been difficult to obtain. The free tools were designed to fill this gap. Robin Lovelace, a researcher at the University of Leeds, Institute for Transport Studies, was instrumental in the creation and deployment of both tools. His expertise in Geographic Information Systems (GIS), data science and software development helped ensure they could be accessed online, nationwide. The Propensity to Cycle Tool (PCT) identifies which routes are in most urgent need of investment currently, and under various scenarios of cycling uptake. It was developed in partnership with four universities: Cambridge (which led the project), Leeds (which led the development of the tool), Westminster and the London School of Hygiene and Tropical Medicine. The Cycling Infrastructure Prioritisation Toolkit (CyIPT) draws together detailed information about every major cyclable road in England together with data on the costs and likely benefits of new infrastructure to inform recommendations about cycling infrastructure investment. It was developed by the University of Leeds with not-for-profit transport tech company CycleStreets.net, the University of West of England and transport consultancy Phil Jones Associates. While the PCT generates scenarios of behaviour change, the CyIPT creates different infrastructure scenarios, and helps prioritise which parts of a strategic cycle network authorities should build first. Used together, the tools can give a robust overview of which routes have greatest cycling potential and where new investment would have the biggest impact. All the software developed by the team is open source – a feature that means users – whether local governments, consultancies or cycling groups – are free to use, copy or modify the tool, or integrate the software into other programmes. The open source nature of the tools will also encourage their uptake internationally. The PCT tool is an interactive map, using information from the Census to show how cycling commuters use current routes. Users can investigate how cycle traffic on these routes might be affected under different scenarios – for example, if the government target were to be reached, or if cycling were to increase to levels similar to those in Holland. Planners can use the PCT as a stand-alone tool, or in conjunction with household surveys and other localised studies to help develop a robust evidence base for cycle infrastructure planning. Crucially, the tool enables cycle routes to be investigated not in isolation, but as networks, which is necessary for developing a holistic view of where to invest in improvements. Chris Peck, of the national charity, the Cycling Tourist Club, explains: "The PCT is a simple and cost-effective way to speed up traditional approaches to transport planning that usually involve constructing ground-up expensive transport models. Local authorities can now use the outputs of the PCT to develop network plans, or verify existing ones. Before the PCT was developed, cycle routes were prioritised on an ad-hoc basis and it was a challenge developing a substantive business case for them." As a further testament to its value, the team has also been contracted by the Department for Transport to update the PCT, adding in travelling to school data. Creating safe routes to school is hugely important to local authorities’ sustainable travel planning. By including this data, the PCT can also be used to help local authorities plan improved routes for school pupils, parents and carers. Designed for use in combination with the PCT, the CyIPT allows planners to explore different investment scenarios. It estimates the costs of constructing different cycling infrastructure projects and the expected number of additional cyclists. This can give important insights into which schemes would have the biggest impact in terms of increasing capacity, improving safety, and delivering value for money. “Essentially what CyIPT does is show how we can operationalise the available data to make meaningful and effective decisions to improve the cycle network in targeted areas,” explains Dr Lovelace. The team is currently working with the World Health Organisation to show how the PCT can be used to develop cycle networks in Nepal and Ghana. The aim is to show how a strong, actionable evidence base can be produced to prioritise investment in cycling in the cities of Accra, in Ghana and Kathmandu, in Nepal. There are plans, too, to develop an ‘Active Transport Tool’, building on CyIPT, which could be used as a universal tool for evaluating cycle infrastructure in cities worldwide. And moving away from cycling, the team has also looked at how their methods can be used to link recycling and public transport routes in Spain.